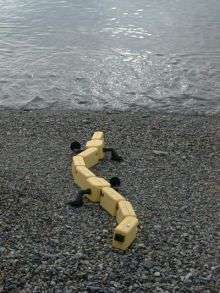 In a paper appearing in the March 9, 2007 issue of the journal Science, scientists from the EPFL in Switzerland and the INSERM research center/University of Bordeaux in France introduce their robot, Salamandra Robotica. This four-legged yellow creature reveals a great deal about the evolution of vertebrate locomotion. It’s also a vivid demonstration that robots can be used to test and verify biological concepts, and that very often nature herself offers ideal solutions for robotics design. Once they thought they had answers to these questions, the team implemented the model – a system of coupled oscillators representing the neural networks in the spinal cord – on a primitive salamander-like robot. Simple electrical signals, like the signals sent from the upper brain to the spinal cord, were sent wirelessly from a laptop to the robot. These signals were enough to cause the robot to change its speed and direction and change from walking to swimming. The model therefore provides a potential explanation – relevant for all four-legged organisms – of how agile locomotion is controlled by distributed neural mechanisms located in the spinal cord. The robot serves here as a useful tool for neurobiology, explains EPFL professor Auke Ijspeert. "We used the robot to show that our model actually reflects reality. The robot was very useful to validate that our model could effectively modulate speed, direction and gait – aspects that need a mechanical "body" to be properly evaluated – and also to verify that the generated movements are close to those of a real salamander." And it’s a vivid demonstration that biology offers unique ideas for robotics design. "Nature found a nice way of making a sophisticated circuit in the spinal cord and then controlling the muscles from there," notes Ijspeert. "It’s a fantastic solution for coordinating multiple degrees of freedom in a simple distributed way." Robots that could change their speed, direction, and gait based on simple remote signals, like living organisms, would be extremely useful in search and rescue operations, for example.